Hair Spray has been around for many years now and is still used by millions of people. Girls need it to hold their hair in position. Boys use it to spike their hair. And wild kids use it to shoot potato cannons. Unilever Best Foods Suave Max Hold Unscented Aerosol Hair Spray - 11 oz. Unilever Best Foods Dove Max Hold Unscented Hair Spray - 11 oz. Unilever Best Foods Suave Max Hold Non Aerosol Hair Spray - 11 oz. 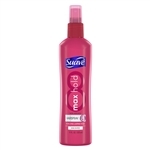 Unilever Best Foods Suave Extreme Hold Hair Spray - 11 oz. Unilever Best Foods Suave Max Hold Aerosol Hair Spray - 11 Oz. Tresemme 2 Non Aerosol Hair Spray Hold - 10 Oz. Tresemme Non Aerosol Hair Spray Super Hold - 2 Fl.Oz. Tresemme Two Extra Hold Hair Spray - 1.5 oz. Hair Spray Suave Aerosol Extreme Hold - 11 Oz. Rave Hair Spray Mega Scented Aerosol - 11 Oz. Rave 4X Mega Unscented AE Hair Spray - 11 oz. White Rain Active Botanicals Extra Hold Aerosol Unscented Hair Spray - 7 Oz. Vo5 Salon Series Perfect Hold Hair Spray - 9 oz. Dove Strength Shine Non Aerosol Hair Spray - 9.25 Fl. Oz. Tresemme Extra Hold Hair Spray - 2 Oz. White Rain Active Botanicals Non Aerosol Unscented Extra Hold Hair Spray - 7 Oz. Rave 4X Mega Unscented Non Aerosol Hair Spray - 11 Fl. Oz. Aerosol Unscented Hard To Hold Hair Spray - 8.5 oz. Vo5 Super Hard To Hold Hair Spray Aerosol - 8.5 oz. Vo5 Brush Out Hair Spray Aerosol - 8.5 oz. Vo5 Extra Body Hair Spray Aerosol - 8.5 oz. Rave Hair Spray 4X Mega Scented Non Aerosol - 11 Oz. Salon Grafix Freezing Hair Spray Mega Hold Aerosol - 10 Oz. Salon Grafix Shaping Hair Spray Extra Super Hold Aerosol - 10 Oz. Salon Grafix Shaping Hair Spray Super Hold Unscented Aerosol - 10 Oz. Pantene Pro-V Style Series Scented Hair Spray - 8.5 Fl. Oz. Hair Spray for your hotel guests and clients should always be kept at the front desk as a courtesy. Also, if you ever build a potato cannon, you will need hair spray to fuel it.